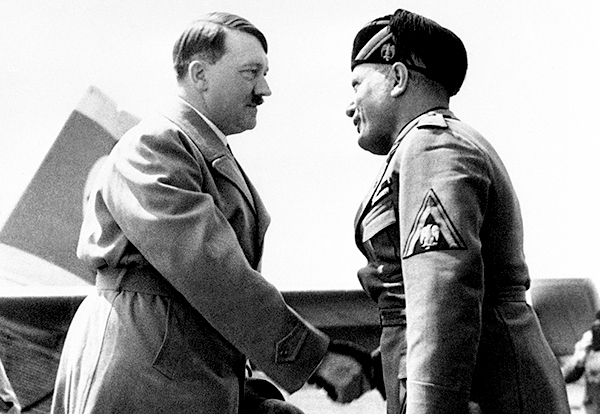 Italy: Adolf Hitler and Benito Mussolini meet at the airfield in Venice, Italy, for the first of their fourteen meetings. Mussolini later describes the German dictator as "a silly little monkey." When Hitler and Mussolini met in Venice, Mussolini was the big shot. It was the first meeting between the two; a year and a half after Hitler was appointed Chancellor of Germany and two months before Hitler becomes the Fuhrer of the Third Reich. While Hitler will go on to overshadow Mussolini's despotism, Mussolini did set the stage for Hitler's regime, showing him that the world was not willing to stand up to his fascist aggression. They would be World War Two's oddest of odd couples. Their relationship would embolden one another to bring devastation to millions and ultimately bring about the destruction of their dictatorial regimes as well as themselves. South America: Brazil leaves the League of Nations. Spain: Day 333 of 985 of the Spanish Civil War. Germany: Laws are enacted requiring all Jews to register their businesses. Spain: Day 698 of 985 of the Spanish Civil War. The Spanish Nationalist forces capture Castellon de la Plana 40 miles north of Valencia. However, the Spanish Republican resistance is increasingly forcing the Nationalists to halt their offensive in order to allow time for their troops to rest before the attack on Valencia. CBI - China: Day 343 of 2,987 of the 2nd Sino-Japanese War. Day 4 of 139 of the Battle of Wuhan. CBI - China: Day 708 of 2,987 of the 2nd Sino-Japanese War. Day 1 of 68 of the Battle of Tianjin. The Japanese blockade the British concession in Tianjin. CBI - Mongolia: Day 35 of 129 of the Battle of Khalkhin Gol, a border dispute between the Soviet Union and Japan. Atlantic: Southwest of Ireland, the German sub U-47 sinks the British ship BALMORALWOOD and U-38 sinks the Greek ship MOUNT MYRTO. Atlantic: German sub U-101 stops the Greek ship ANTONIS GEORGANDIS 300 miles west of Cape Finisterre, Spain. After the crew abandons the ship, U-101 sinks her with its deck gun. ETO - France: Day 36 of 44 of the Battle of France. German troops take Paris and Le Havre. To the east, Germans punch through the Maginot Line near Saarbrücken. All British troops in France are ordered to return. Germany: A group of 728 Polish political prisoners from Tarnów become the first prisoners of the Auschwitz Concentration Camp. Eastern Front: The USSR issues another ultimatum to Lithuania to become a puppet state under them. Meanwhile, the Soviets begin air and naval blockades of Estonia. MTO - Italy: At dawn, French warships shell the oil storage tanks at the port of Genoa. British carrier Swordfish planes make the first Allied air attack on Italy, hitting Genoa with French bombs. MTO - Morocco: Spanish troops enter and occupy the international city of Tangier, which they will keep until the end of the war. MTO - Libya: British troops in Egypt cross into Libya and capture Fort Capuzzo and Maddalena, destroy the fixed guns and emplacements and then retire back to Egypt. East Africa: Day 5 of 537 of Italy's East African campaign in the lands south of Egypt. CBI - China: Day 1,074 of 2,987 of the 2nd Sino-Japanese War. Day 213 of 381 of the Battle of South Guangxi. Day 45 of 49 of the Battle of Yichang. USA: President Roosevelt orders the freezing of all German and Italian assets, as well as those of the occupied countries. Atlantic: German sub U-751 sinks the British ship ST LINDSAY 700 miles west of Ireland. ETO - France: The RAF begins daylight fighter sweeps across northern France. Germany: Hitler meets with his top generals to discuss the upcoming invasion of the USSR. The Soviet LUCY spy ring passes this information to Russia, detailing the start date as the 22nd of June. Estonia: The Soviets begin "The June Deportation" which is the first major wave of murders and of mass deportations of Estonians, Latvians and Lithuanians to Siberia. MTO - Yugoslavia: Croatia joins the Tripartite Pact. MTO - Italy: The British sub HMS CLYDE sinks the Italian ship GIOVANNI BOTTIGLIERE south of Sardinia. MTO - Libya: Day 66 of 256 of the Siege of Tobruk. British tanks gather on the Egyptian-Libyan border for a major offensive. The Germans detect the movement and begin an artillery barrage on Tobruk. Middle East: Day 7 of 37 of the Battle for Syria and Lebanon. British destroyers begin bombarding Sidon. Vichy French destroyers come in to counter-attack but are chased off by other New Zealand and British destroyers. East Africa: Day 370 of 537 of Italy's East African campaign in the lands south of Egypt. CBI - China: Day 1,439 of 2,987 of the 2nd Sino-Japanese War. UK: The King, Queen and Princesses, along with the heads of a number of Allied countries, attend a United Nations Day ceremony in London. UK: Air Marshal "Bomber Harris" is recognized for his achievements with the recent 1,000 bomber raids with a knighthood. Atlantic: Day 152 of 169 of Germany's Second "Happy Time," during which U-boats sink 609 Allied ships with little risk. Russian Front - North: Day 280 of 872 of the Siege of Leningrad. Russian Front - North: Day 41 of 658 of the Siege of the Kholm Pocket. Russian Front - Center: Day 17 of 31 of Operation KREMLIN, a German diversion to trick the Soviets into thinking Moscow is their main objective instead of Stalingrad and the Caucasus. Russian Front - South: Day 228 of 248 of the Siege of Sevastopol, Crimean Peninsula. German troops capture Fort Stalin outside of town. MTO - Tunisia: The Axis attack two Allied convoys off the coast of Tunisia, sinking three freighters. MTO - Libya: Day 20 of 27 of the Battle of Gazala. The British command decides to abandon the Gazala Line. East Africa: Day 41 of 186 of the Battle of Madagascar. CBI - China: Day 1,804 of 2,987 of the 2nd Sino-Japanese War. Day 31 of 124 of Japan's Zhejiang-Jiangxi Campaign, launched to punish anyone suspected of aiding the Doolittle raiders in China. Roughly 250,000 Chinese will be killed. PTO - Alaska: Day 8 of 435 of the Battle of Kiska, Aleutian Islands. US 11th Air Force B-17s and B-24s bomb shipping in the harbor of Kiska Island, hitting 2 cruisers. Meanwhile, the Japanese bomb Nazan Bay on Atka Island. PTO - Malaya: Day 116 of 357 of the Battle of Timor Island. Atlantic: RAF Coastal Command begins flying daily patrols over the Bay of Biscay with aircraft equipped with new detection devices able to locate and destroy German U-boats found coming and going from their bases on the French coast. Russian Front: A German report shows that 100,000 cases of typhus were reported on the Russian front during 1942, with a fatality rate of 15%. Russian Front - North: Day 645 of 872 of the Siege of Leningrad. Russian Front - North: Day 406 of 658 of the Siege of the Kholm Pocket. MTO - Italy: US 12th Air Force RAF Wellingtons bomb Messina, Sicily. CBI - China: Day 2,169 of 2,987 of the 2nd Sino-Japanese War. US 14th Air Force intercepts a squadron of Japanese bombers and fighters 25 mi southwest of Nanchang and shoot down 7 of the fighters. PTO: Day 19 of 47 adrift in a raft for survivors of B-24 GREEN HORNET. PTO - Alaska: Day 373 of 435 of the Battle of Kiska, Aleutian Islands. PTO - Gilbert Islands: US 7th Air Force bombs the runways on the Tarawa Atoll. PTO - New Guinea: Day 54 of 148 of the 2nd Battle of Lae-Salamaua. US 5th and 13th Air Forces provide air support. PTO - Solomon Islands: US 13th Air Force hits the airfields at Vila and Kahili. ETO - UK: Day 2 of 86 of the V-1 "Buzz Bomb" offensive on Britain. ETO - France: Day 9 of 49 of Operation OVERLORD, the Allied invasion of Normandy, France, known forever simply as D-Day. D-Day+8: The British King and Charles de Gaulle pay a visit to the Normandy front (separately). ETO - France: Day 9 of 62 of the Battle of Caen. ETO - France: Day 9 of 25 of the Battle of Cherbourg. Day 5 of 5 of the Battle of Carentan. US troops capture Carentan. Russian Front - Finland: Day 5 of 11 of the Battle of Vyborg. The Soviets continue their offensive against the Finns on the Karelian Isthmus, north of Leningrad. Russian Front - North: Day 134 of 191 of the Battle of the Narva Isthmus, Estonia. Both German and Soviet troops remain locked in their defensive positions. MTO: US 15th Air Force B-17s and B-24s attack oil related targets in Czechoslovakia and Hungary. MTO - Italy: Day 10 of 16 of the Battle of the Trasimene Line (north of Rome). Allied Air Forces provide air support. The British take Orvieto while the US captures Magliano. CBI - Burma: Day 102 of 166 of the UK's Operation THURSDAY. Monsoon season bogs down all operations. CBI - Burma: Day 97 of 147 of the Battle of Myitkyina. US 10th Air Force provides air support. Monsoon season bogs down all operations. CBI - Burma: Day 75 of 302 of the Chinese Salween Offensive. US 14th Air Force provides air support. Monsoon season bogs down all operations. CBI - China: Day 2,535 of 2,987 of the 2nd Sino-Japanese War. Day 59 of 259 of Japan's Operation ICHI-GO. CBI - India: Day 99 of 118 of the Battle of Imphal-Kohima. PTO - Japan: The US sub USS GOLET is missing. It's believed she was sunk by Japanese naval vessels off Honshu. PTO - New Guinea: Day 19 of 83 of the Battle of Biak. 5th Air Force provides air support. PTO - New Guinea: Day 183 of 597 of the Battle of New Britain. US 13th Air Force provides air support. PTO - New Guinea: Day 54 of 481 of the Battle of Western New Guinea. 5th Air Force provides air support. PTO - New Guinea:Day 1 of 80 of the Battle of Lone Tree Hill. PTO - Solomon Islands: Day 227 of 295 of the Battle of the Bougainville Islands. US 13th Air Force provides air support. Germany: German Foreign Minister Joachim von Ribbentrop is captured in Hamburg. He will be convicted for war crimes at the Nuremberg Trials and hanged on 16 Oct 46. CBI - China: Day 2,900 of 2,987 of the 2nd Sino-Japanese War. Day 75 of 91 of the Battle of Zhijiang. US 14th Air Force provides air support. Japanese troops continue pulling out of China. PTO - Borneo: Day 5 of 67 of the Battle of North Borneo. PTO - Dutch East Indies: Day 45 of 52 of the Battle of Tarakan Island. PTO - Japan: Day 75 of 83 of the Battle of Okinawa. PTO - New Guinea: Day 535 of 597 of the Battle of New Britain. US 10th Air Force provides air support. PTO - New Guinea: Day 419 of 481 of the Battle of Western New Guinea. US 10th Air Force provides air support. PTO - Philippines: Day 237 of 299 of the 2nd Battle of the Philippines, aka the Liberation of the Philippines or the Philippines Campaign. PTO - Philippines: Day 182 of 244 of the Battle of Luzon. 5th Air Force provides air support. PTO - Philippines: Day 97 of 159 of the Battle of Mindanao Island. 5th Air Force provides air support. PTO - Philippines: Day 89 of 135 of the Battle of the Visayas region. US 5th and 7th Air Forces provide air support. 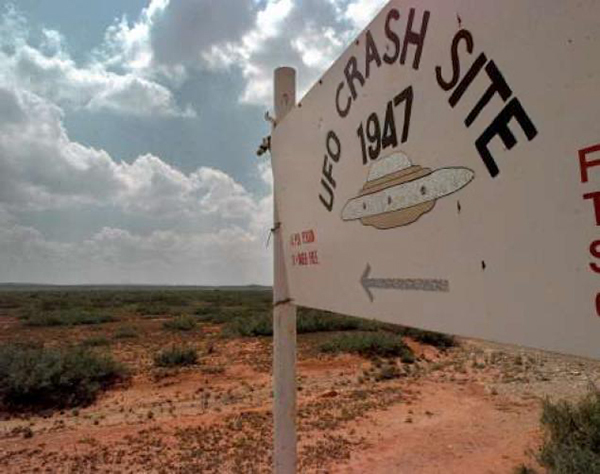 USA: An Unidentified Flying Object is said to have crash-landed on the ranch of Mac Brazel outside of Roswell, New Mexico, during a violent thunderstorm. It will become a hallmark incident in modern UFO mythology, an event that simply refuses to die. From 1947 though the 1980's, local residents of Roswell fell into one of three camps: 1) Believers, 2) Non-believers, and 3) Those that didn't know what to believe. One thing they all came to have in common, though, was a resolve to simply not talk about it. That was especially true in local bars where over the decades too many friendly discussions had escalated into full-scale barroom brawls on par with those of Hollywood westerns. But then along came a 1994 made-for-TV movie called "Roswell" which sparked nationwide interest in UFOs, ETs and the city of Roswell. A steady stream of curious people made Roswell a destination, flowing into town from across the country and soon from around the world, all eager to feel part of an excitement. Local businesses could no longer maintain their code of silence, and opted to deliver what the tourists were seeking. UFO museums and souvenir shops quickly met the demand. 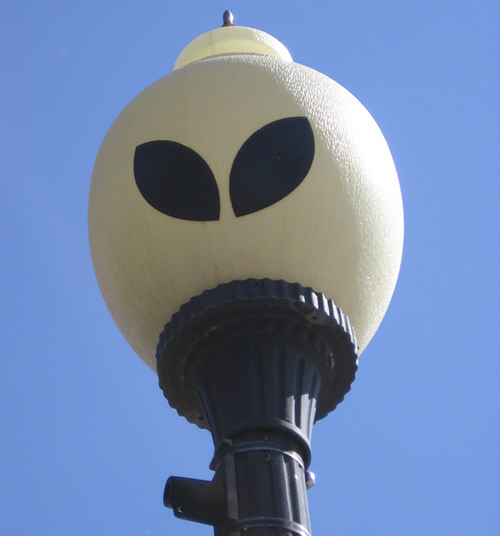 Businesses from restaurants to motels to banks began to adorn their marquees and windows with stereotypical big-eyed, little green men and crashed saucers. Soon Roswell became host to alien conventions, festivals and tours. The city even touched up many of their lamp posts to comply with this new image. 2) Non-believers that are willing to take advantage of the tourism, and 3) Those that don't know what to believe but are willing to take advantage of the tourism. What does any of this have to do with World War II, you ask? Nothing, really. But what cannot be denied is that there were reports of still-unexplained "Foo-Fighters" by Allied and Axis pilots alike, that something crashed on Mac Brazel's ranch on this day, and that it was initially announced by the US Army as being a "Flying Saucer." From there, you are on your own.